Our patented Ladder Clamps are designed to provide security and safety to anyone needing to carry a ladder on their vehicle ladder rack. QUIK-LOCKS come in SIDE MOUNT and BOTTOM MOUNT versions to fit your specific application. Our ladder rack clamps are made from rust free aluminum with rubber tipped hooks and nylon coated pivot assemblies. They can be locked with a standard long shank padlock to keep your ladder protected from theft. Each QUIK-LOCK comes with a mountable ladder restraint strap to use as a secondary tie-down to keep the ladder from rattling while to vehicle is in motion. Both ladder clamps are UPS shippable and install in minutes using provided stainless steel hardware. Get hooked with the QUIK-LOCK from Able Equips! 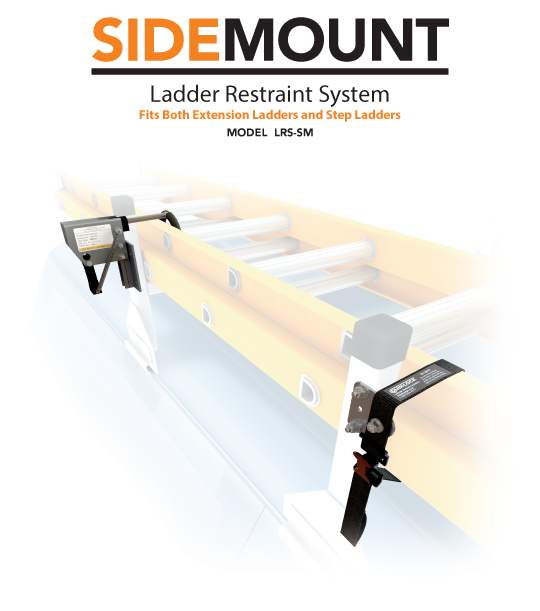 The Side Mount Ladder Restraint (Model LRS-SM) secures your ladder on a vehicle ladder rack. Our patented spring action, the ladder lock hook swings over the rungs and lock the ladder in place. Using our specially designed universal mounting bracket, this ladder clamp can be mounted on virtually any van, truck cap, KUV, service or utility body ladder rack on the market. The Side Mount Ladder Restraint has a horseshoe shaped hook and is mounted on the side of the ladder rack. The Side Mount ladder clamp will secure either a step ladder or an extension ladder. It also comes with a secondary restraint strap to tie down the other end of the ladder to keep the ladder from vibrating while the vehicle is in motion. 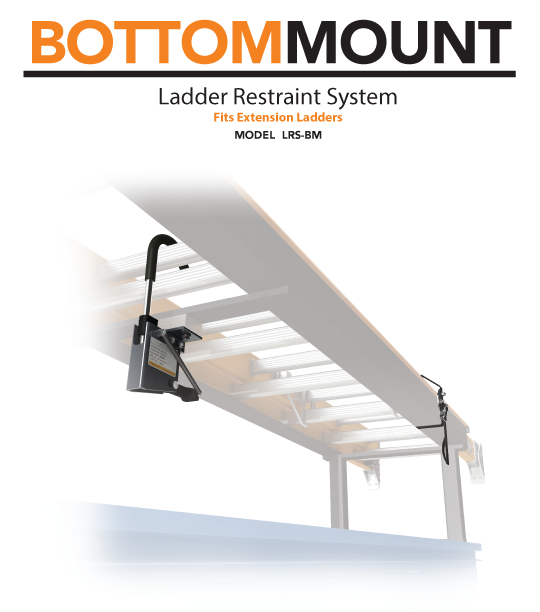 The Bottom Mount Ladder Restraint (Model LRS-BM) secures your ladder on a vehicle ladder rack. Our patented spring action, the ladder lock hook swings over the rungs and lock the ladder in place. Using our specially designed universal mounting bracket, this ladder clamp can be mounted on virtually any pick-up truck, utility or service body ladder rack on the market. The Bottom Mount Ladder Restraint has a candy cane shaped hook and is mounted on the underside of the ladder rack. The Bottom Mount ladder clamp will secure an extension ladder. It also comes with a secondary restraint strap to tie down the other end of the ladder to keep the ladder from vibrating while the vehicle is in motion.